Welcome back to the blog! The Springtacular series is now over, and we are back to our regular scheduled programing! If you want to check out the series click here. I decided to come back with this little guide on buying denim. 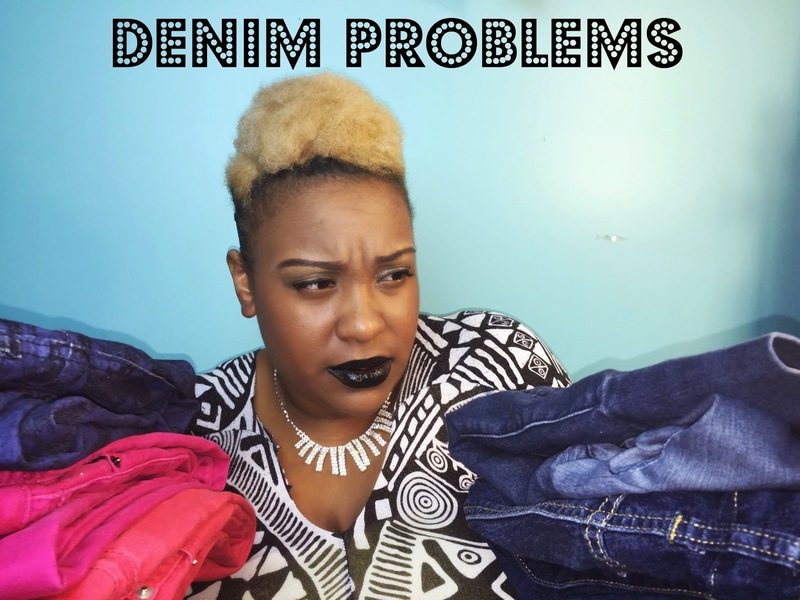 Alot of people, especially us curvy women, have trouble buying denim. Either they fit at the waist but not at the bottom, or they don’t fit at all. So I decided to give you some tips that I use when I purchase denim. Afterall they are the most common article of clothing in my wardrobe! I only wear denim like 120% of the time, so I am pretty much a pro at buying jeans! So enjoy the video, and meet me below for more details! I hope you enjoyed the video! Hopefully it was very helpful! Now lets get into the details! I know it sounds silly but TRY ON YOUR JEANS!!! Alot of people skip the fitting room because maybe the line is too long, or maybe you just don’t feel like trying on. No matter how long the line is, or how you feel TRY ON THE JEANS! You will be really upset when you get home and find out that the jeans you just grabbed don’t fit! I advice taking 3 pairs of the same type of jeans. So I will take one pair of jeans and try on a size 18, 20, and 22 in them. This will save the hassle of having to go back in forth from the dressing room just in case a pair doesn’t fit. Some stores that carry denim have letters beside the size. The letters may indicate that this type of jean is Tall, Petite, Regular, or Wide. I would say to def pay attention to the label, and if the tag has any of these letters to purchase the one that applies to you. Since I am tall I like to purchase jeans that have a T next to them. This ensures that the length of the jeans caters to my long legs. I also like to look for jeans that may have a W next to them because my hips are wide and those cater to my hips. If they don’t have a letter next to them don’t worry! Just refer to tip 1 and try them on! Alot of jeans tend to be pricey, but don’t let the price tag keep you away from purchasing a good pair of jeans! Buying jeans that may be $60 or above is a good idea because this means that they will last you a long time! They wont wear and tear as easily, and you definitely will get alot of wear out of your jeans! Ok so maybe you don’t have $60 to pay for an amazing pair of jeans. Well Forever21 is the perfect place for a good pair on inexpensive jeans! The jeans are mostly under or a little over $20, and they come in all different kinds of colors and prints. I would say to def check over there if your a little short on cash, but still want to look fabulous. Here’s a list of places where you can purchase jeans. I personally buy all my jeans from thease stores, so I hope this help you! Ladies I hope that this helped you! Let me know how if any of these tips and tricks work out for you! I will see you guys later this week with another video! So until then ladies, love ya lots like tator tots, and see you soon!